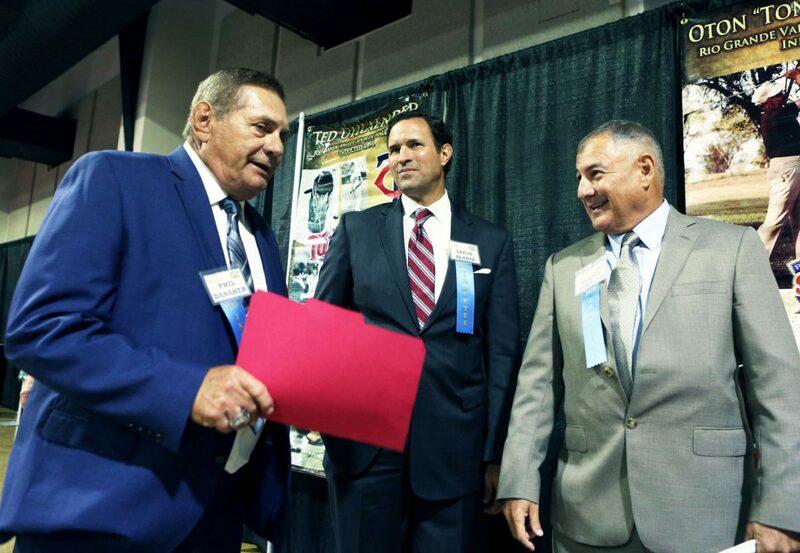 Inductees Phil Danaher, left, Steve Alaniz, center, and Sammy Monatalvo, talk together before being inducted into at the annual Rio Grande Valley Sports Hall of Fame induction ceremonies at the Pharr Events Center on Saturday, June 30, 2018, in Pharr. PHARR — Former collegiate national champions, state finalists, World War II veterans and an NFL draft pick, plus other pioneers in their respective sports all had one thing in common Saturday evening. All of them became classmates in the RGV Sports Hall of Fame. 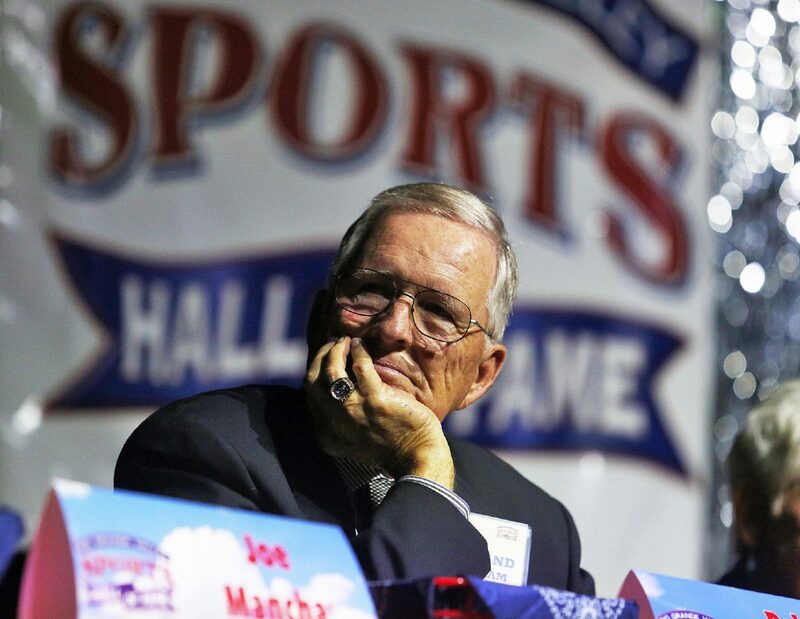 Ten individuals were enshrined either in person, with loved ones accepting on their behalf or posthumously at the Pharr Events Center as part of the 31st annual Rio Grande Valley Sports Hall of Fame induction ceremony. Children spoke of their late parents, reflecting on the moment they realized their parent had been a special athlete. Regina Mancha, daughter of Joe Mancha, a 1953 McAllen High graduate, said she didn’t learn her father was a football player until she found his letterman jacket in Chicago. She didn’t realize how much of an impact he made on the area until her fifth-grade teacher in Hidalgo “about fainted” when she found out Joe was her father. Tony Villarreal talks with other inductees and guest before he was inducted in at the annual Rio Grande Valley Sports Hall of Fame induction ceremonies at the Pharr Events Center on Saturday, June 30, 2018, in Pharr. Roland Ingram looks over at a video of his sports career before he is inducted in at the annual Rio Grande Valley Sports Hall of Fame induction ceremonies at the Pharr Events Center on Saturday, June 30, 2018, in Pharr. Roland Ingram speaks after being inducted in at the annual Rio Grande Valley Sports Hall of Fame induction ceremonies at the Pharr Events Center on Saturday, June 30, 2018, in Pharr. 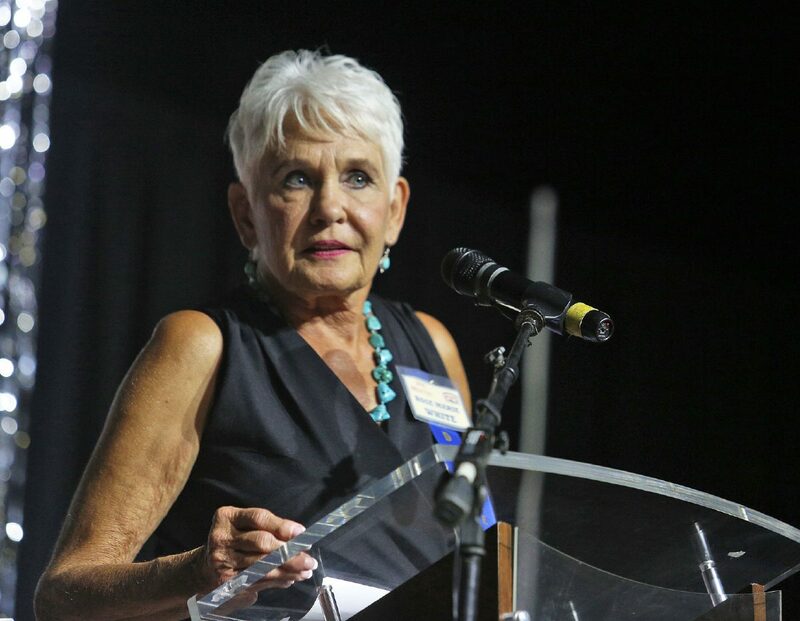 Rose Marie White speaks after being inducted in at the annual Rio Grande Valley Sports Hall of Fame induction ceremonies at the Pharr Events Center on Saturday, June 30, 2018, in Pharr. 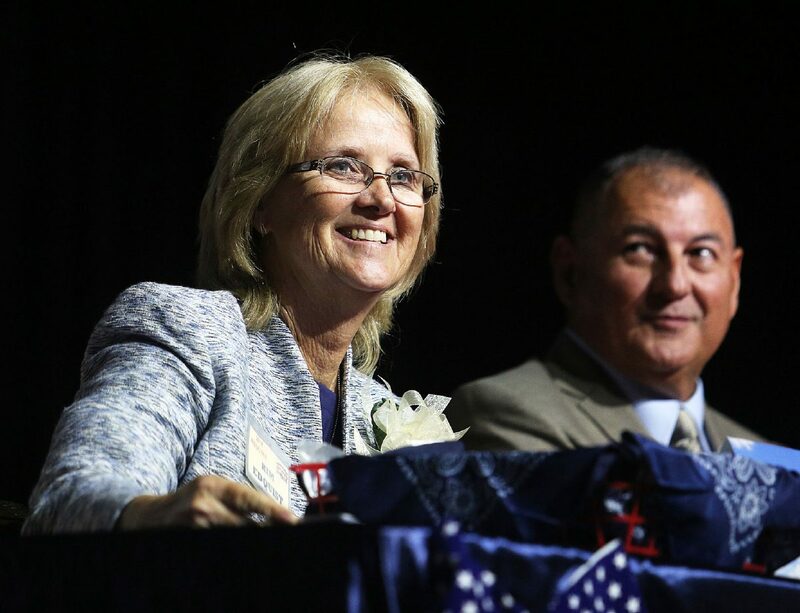 Kim Edquist smiles as she listens to kind words as she is inducted in at the annual Rio Grande Valley Sports Hall of Fame induction ceremonies at the Pharr Events Center on Saturday, June 30, 2018, in Pharr. Sammy Montalvo smiles as he looks at a video of him self running in the state meet before being inducted in at the annual Rio Grande Valley Sports Hall of Fame induction ceremonies at the Pharr Events Center on Saturday, June 30, 2018, in Pharr. 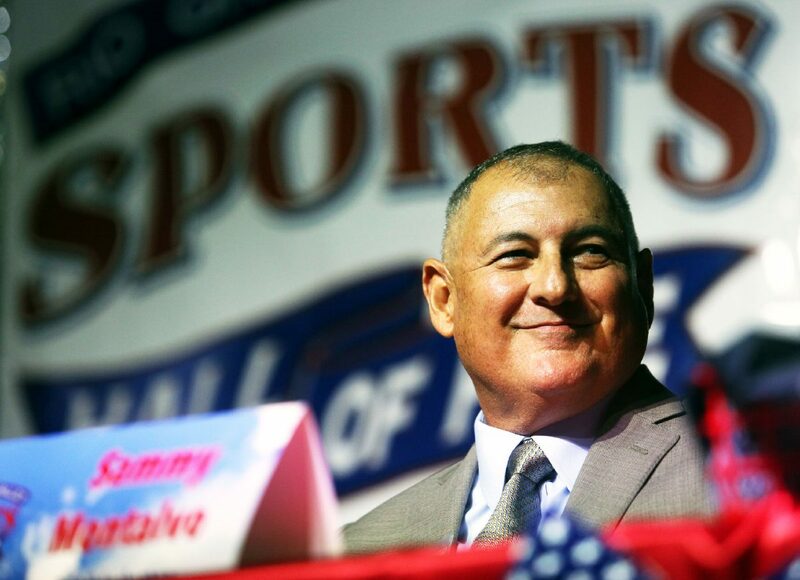 Sammy Montalvo speaks after being inducted in at the annual Rio Grande Valley Sports Hall of Fame induction ceremonies at the Pharr Events Center on Saturday, June 30, 2018, in Pharr. 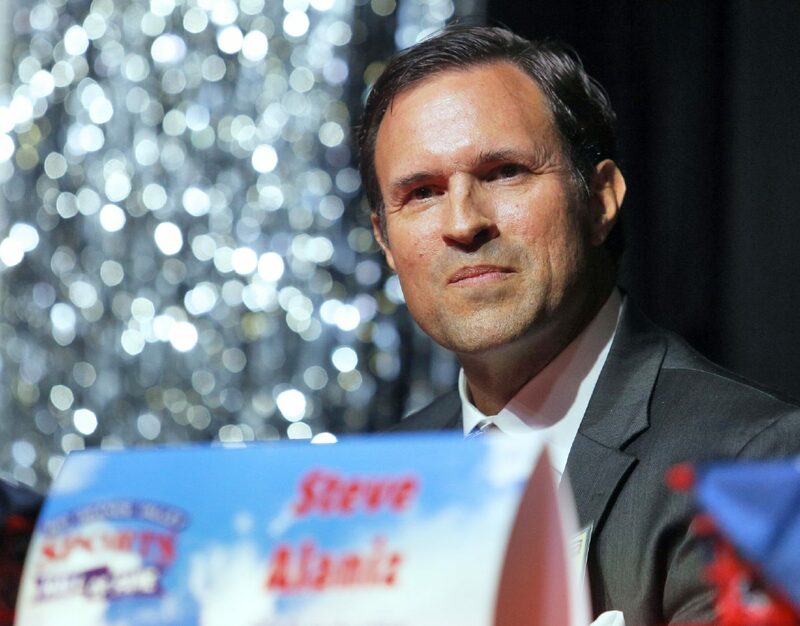 Steve Alaniz listens to accolades before being inducted in at the annual Rio Grande Valley Sports Hall of Fame induction ceremonies at the Pharr Events Center on Saturday, June 30, 2018, in Pharr. 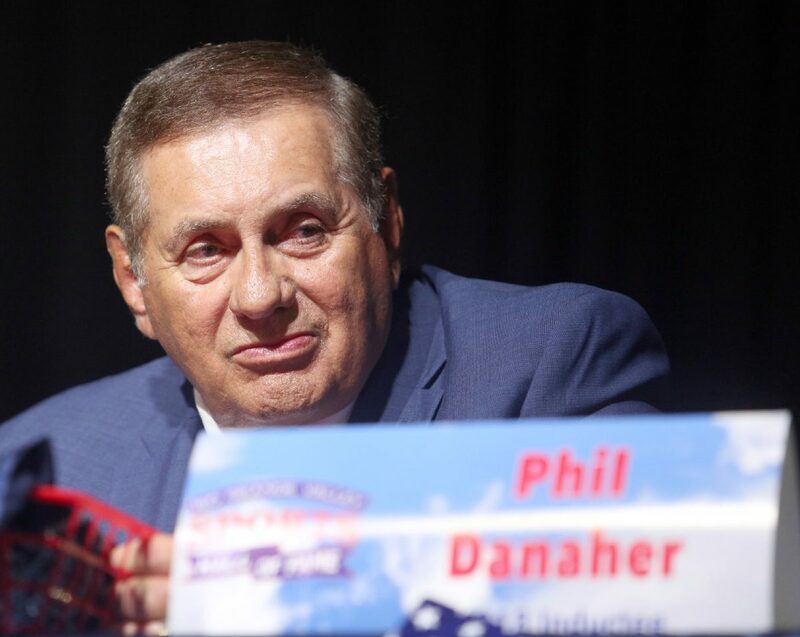 Phil Danaher waits to be inducted in at the annual Rio Grande Valley Sports Hall of Fame induction ceremonies at the Pharr Events Center on Saturday, June 30, 2018, in Pharr. Joe Mancha was on the best McHi team in program history, which upset top-ranked San Antonio Edison before falling in the state semis in 1952. The children of the late John Tripson, who would have turned 99 years old this year, made the trip from Florida to the area that the big lineman left for good after a scholarship sent him to Mississippi State. Tripson played in the 1941 Orange Bowl and was the NFL’s rookie of the year in 1941 for his season with the Detroit Lions. That was his only year in the league before he was shipped overseas to fight in World War II. His two sons, Jim and Mark, said their father wasn’t one to rehash the glory days, but his parenting spoke volumes of his character. Becky (Dube) Thomas wasn’t in attendance, but her middle and high school coach at Lincoln and Travis, Teresa Casso, spoke on her behalf. 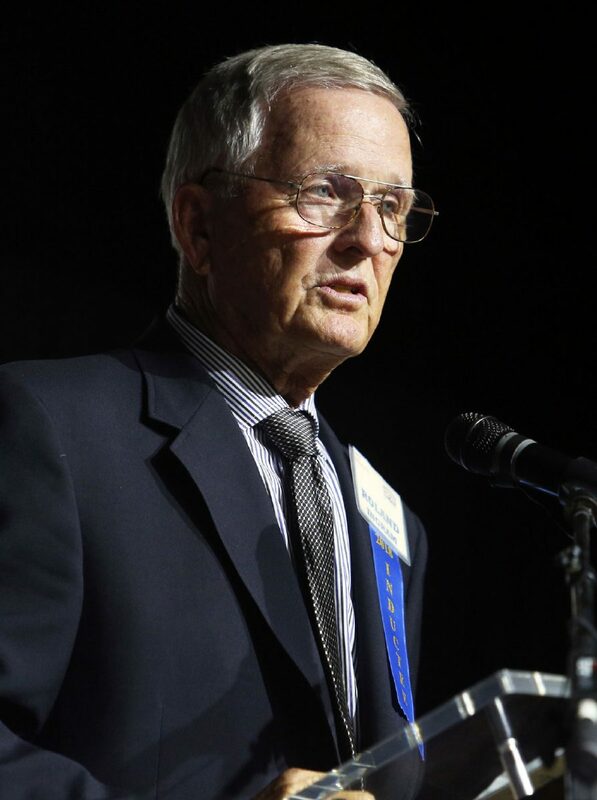 Tennis coaching legend Ronald Ingram admitted that he wasn’t the best high school tennis player when he came out of Harlingen in 1957, but “God’s plan” put him on a path to coach the TCU women’s team for 19 years and to four conference titles across three different conferences. 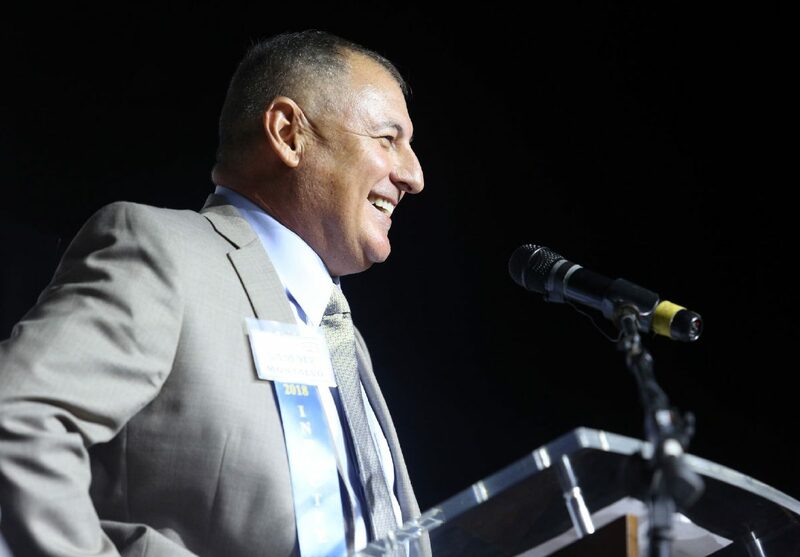 Longtime voice of the Mission Eagles and Mission CISD Ciro Ochoa Jr. was given the Distinguished Service Award. His signature line, “Most pleasant evening everyone and welcome to Tom Landry Stadium,” is still a phrase that Mission fans might remember from the heyday of the program, when Koy Detmer was in the huddle and not on the sidelines. Longtime Valley football coach Tony Villarreal III was honored for his time as a head coach at Port Isabel, PSJA North, Brownsville Hanna and Weslaco High. 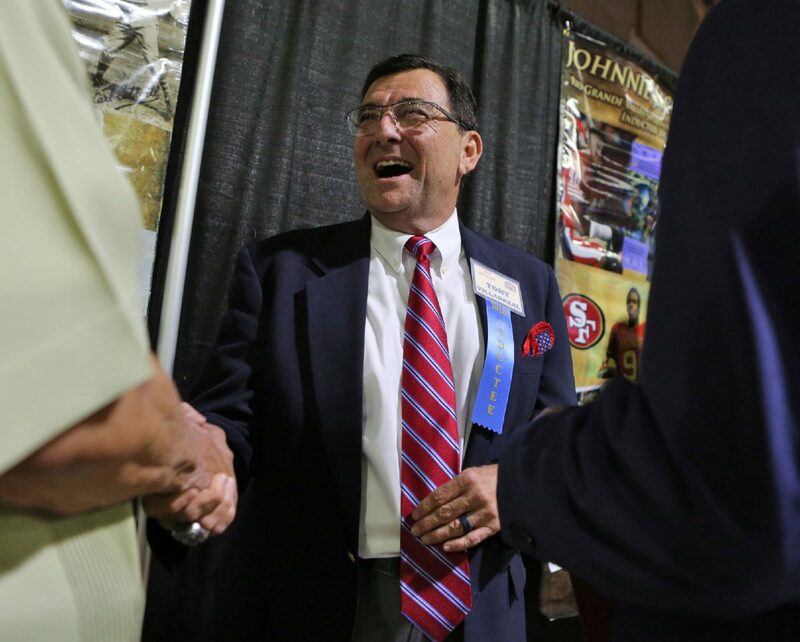 Villarreal, Steve Alaniz and Phil Danaher were the last speakers to be inducted. Alaniz played for Richard Flores on some of the best Edinburg High teams assembled in the 1980s before moving on to Notre Dame and winning a national title during his senior season under Lou Holtz. Phil Danaher, who coaches at Corpus Christi Calallen, reminded the crowd that the Valley is still in his heart. Even with 34 years at his current job, and the most wins in state coaching history (445), his connection to Harlingen High and the Valley didn’t recede. Eric Gonzalez is a current University of Texas optometry student who played on the Longhorns football team after starring for Weslaco High under Villarreal. One of Villarreal’s former Weslaco Panthers assistant coaches, Mario Lazo, summed up the impact of just about every coach honored at the ceremony.